Trendex believes that a software package should be flexible in order to meet the requirements of an everchanging environment while maintaining its high level of integration. The ongoing collaboration with our present installations ensures that all Trendex software meets the actual day-to-day needs of the user. And as those needs change, our software will change with them. Trendex continues to invest the time and energy necessary to keep its software in the forefront, satisfying all your requirements. All software developed by Trendex works in a multi-user environment and supports multiple companies, multiple locations and multiple currencies. Trendex software is trilingual which allows the user to switch from English to French to Spanish at the click of a button. All Trendex software is written in the BBj® programming language and is completely transportable between many different environments. GASTREND™ is a complete and easy to use accounting and cylinder control software package designed to meet the present and future needs of all compressed gas and welding supply distributors, regardless of size. GASTREND™ has been called by our customers as the most complete, most cost-effective, and easy to use system they have ever used. Trendex has been supporting compressed gas distributors and welding supply houses since 1981. We know your industry. 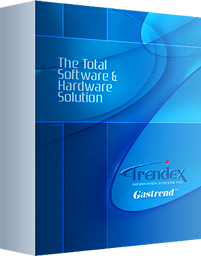 In developing GASTREND™, Trendex worked in close collaboration with gas distributors themselves, to ensure that the package meets the actual day-to-day needs of the industry. And as those needs change, GASTREND™ will change with them. Customers may be retrieved by number, through an alpha search, by phone number, by address, by zip code or by sales rep number. Multiple aged trial balance by customer, by sales rep, collection report, specific aging report in detail or summarized. Customer inquiry allows entry of collection comments & call back date. The user may also view at the touch of a key, a customer’s credit status including average payment days & greatest amount owed, the details of a particular outstanding invoice/credit and all historical information concerning invoice payments. Automatic Dunning letter is sent to your customers for overdue invoices. Cash receipts may be applied to single or consecutive invoices. Cash receipts can be voided & information reversed. Detailed monthly customer statements may be printed when required. Detailed A/R transaction history retained by the system which can be printed or viewed on screen. All accounting functions are based on an open item system. Vendors may be retrieved by number or through an alpha search by alpha, phone/fax number. Automatic Accounts Payable invoice update from purchase orders. Multi-currency option without limitations with daily conversion factors. On screen inquiry of outstanding invoices in domestic or foreign currency. Calculates invoice due date and discount amount from terms in vendor file. Cash requirements report notifies user of cash requirements and vendor discounts. Multiple payment options available (i.e. : post directly to G/L without previously posted invoices). Vendor checks can be voided & information reversed. Check reconciliation provides accurate status of outstanding checks. Detail/summarized trial balance showing aged total vendor converted to domestic currency. Detailed A/P transaction history retained by system which can be printed or viewed on screen. Financial Dashboard gives you a complete and accurate view of your company. Totals kept by period by G/L number. Thirteenth period for year end adjustments. Audit trails provided through G/L journals, registers and inquiries. G/L Trial Balance for period 1 to 13 with option to convert to domestic currency. Budgets by G/L account & fiscal period. Free format user-defined financial statements including comparative statements against budget or previous year, as well as period 13 and consolidated financials. Automatic updating of journals to the G/L with unique journal entry number and source code from Accounts Receivable, Accounts Payable, etc. Allows for recurring General Ledger entries with automatic updating of annual contract sales. Complete G/L transaction history retained for an unlimited period of time which can be printed or viewed on screen. Direct ordering or invoicing of gases & products. Product kits can be invoiced and component & finished product inventory is automatically adjusted. Customer accounts and information automatically retrieved. Automatic verification of customer credit status during order entry. Multiple ship to addresses per customer. Automatic pricing including promotional prices, special prices and brackets by group. Multiple levels of discounts: by customer, by invoice, by item or by product group. Order & delivery time is recorded during order/invoice entry, then printed on orders and detailed on a report for customer service analysis. Line items can be allocated for real-time inventory control, allowing backorders to be printed at the time that they are received into inventory. Follow-up of backorders with reports & inquiries by order number, by product, by customer, by customer’s purchase order and by sales rep. Inventory adjusted instantly at time of order entry (on line). Allows non-stock products and duplicate item entry. Allows entry of extra charges & special messages per item and per order. Transport charges can be automatically calculated according to type of gas purchased and/or by transport zone, or a flat charge can be applied by customer per order/invoice. Orders may be printed directly from order entry screen. Detailed sales journal by order number & invoice number, with profit margin, tax & product group summary. Daily & Monthly sales inquiries and reports. Detailed tax reports automatically generated. Complete history of gas/product, cylinder rental, yearly lease and equipment rental invoices retained. Invoices may be viewed or reprinted from history. The counter sales module allows the user to make over the counter sales invoices. The system tracks inventory and produces detailed journals. Bar code readers can be attached to the terminals to scan products being sold in a store environment. Invoices, statements, purchase orders, quotes, rental invoices, leases and even reports can be faxed or emailed directly from the software. The laser forms module allows you to generate accounts payable checks, gas/product invoices, statements, purchase orders, quotes, cylinder rental invoices and leases on blank paper directly on a laser printer. This eliminates the need for preprinted forms. Forms may be printed in black & white or in vibrant color. Hazardous material surcharge (HAZMAT) calculated automatically on specific gases and/or products. Charges can be defined as a standard charge for all customers or as special charges per customer. Different amounts can be setup on gases, products and/or bulk gases. The quotation system allows the user to make quotes to existing and new customers with existing and new products. The quote can be updated to an order automatically. The serialized inventory system allows the user to keep track of hard goods inventory by serial numbers as they are received and sold. Automatic detailed demurrage, daily, monthly and annual rental and cylinder grouping. Listing of yearly rental contracts by expiration date due for renegotiations. System keeps track of accrued yearly rentals. Listing of yearly rental contracts for rental deposits and amount outstanding. Keeps track of cylinders at customer’s location and in stock in your inventory. Cylinders not sold by you to specific customers are detected. Complete cylinder transaction history retained by customer by cylinder. Serialized Cylinder Control allows the user to keep track of cylinders by serial number with or without bar codes as they are received in inventory (dock – cylinders full), as they are rented to customers (serial numbers will be printed on invoices and on daily, monthly and yearly rental invoices), and as they are returned to you by customers (dock – cylinders empty). Inventory purchases integrated with Accounts Payable Module. Gases, cylinders and products may be retrieved by number, through an alpha search, by a keyword, or by group. Unlimited grouping of gases, cylinders and products. Multi-warehousing with unique costing, selling, price, minimum and maximum quantities, etc. by warehouse. Four suppliers per product with associated product number and cost. Details of alternate products available in inventory. Eleven levels of standard prices by product, prices according to quantity breaks and special prices. Quantities may be kept in decimals (ie. :2.50 kilograms). Selling prices & costs may be kept with a maximum of six decimals(i.e.:$2.0525). Taxing is maintained at product level. Three locations supported by product per warehouse. On screen inquiry for gases and products with information regarding: quantity on hand, quantity on order, quantity committed, quantity available and selling prices associated with each gas/product as well as the major customer price, the special price per customer and transport costs & environment surcharge. Special prices by product, by customer, by group with expiry date. Automatic purchase order selection based on preset criteria. Purchase orders generated according to language code of vendor. Follow-up of backordered purchase orders by purchase order, by product , by supplier, by date ordered and by date requested. Purchasing of non-stock products is supported. Price quotation by supplier with expiry date. On screen inquiry showing complete history of purchase orders. Average, standard, landed and supplier costs updated at stock reception. Requisitions may be placed by warehouse to Head Office. Transfers and product adjustments done by warehouse. Detailed/summarized movement and valuation report by warehouse. Inventory Replenishment report which details items below minimum, prints number of inventory turns and calculates EOQ quantity. Inventory count sheet may be printed by location, by group, by warehouse. Automatic and manual cost & selling price increase. Automatic selling price & cost increases via suppliers’ files. Maintains complete sales history for multiple years. Sales by customer, by territory and by salesrep with variance between this year and last year. Detailed sales statistics by customer, by salesrep, by product, by product group, by gas and by invoice. Sales by customer by revenue G/L. Sales ranking reports by customer and by product for the current year and last year. Sales rep commission reports by invoice, by group and by product. Sales inquiry will display for all or a specific sales rep sales amounts for current year and last year per month with grand totals. The same inquiry also available for all or a specific customer. Pertinent tax, UIC, CPP/QPP, held in information tables corresponding with government (Provincial and Federal) booklets (will accommodate multiple provinces). Unlimited employee file by department with basic deductions (such as UIC, CPP/QPP and federal and provincial tax) as well as other deductions set by percentage or amounts with activation and termination dates (such as, group insurance, union, WCB...). The employee deductions may be updated to different General Ledger accounts according to the departments. Unlimited additional miscellaneous user defined employee earnings and deductions may be entered. Each earning and deductions is set by date of activation and termination, percentage or amount, and taxing may be calculated for each code. Employees can be set up for weekly, biweekly, monthly or semi-monthly pay periods, and for hourly or salary pay, as well as commissions. Remarks may be entered for each employee and all necessary information regarding the employees. Automatic and manual payroll postings with automatic check print and manual check pay sheet. Payroll journal and automatic update to the General Ledger. A monthly payroll journal may also be printed with Federal and Provincial deductions at source summary. T4 and Releve 1 slips as well as the DAS summary can automatically be printed at year end. Complete history of payroll deductions and earnings month-to-date, year-to-date and lastyear figures. Detailed payroll history information can be retrieved and/or printed. Monthly union dues report may also be printed. Bar code scanners can be used to read bar codes on the products to generate invoices at the counter. Bar code label printers can be used to print bar coded price tickets. The bulk gas delivery routing module will let you know in advance which bulk customers need gas delivered. Gastrend will track the average gas usage per day and advise you when bulk gas delivery should be made and even automatically print the Delivery Note for your driver to deliver the bulk gas. Complete a payment with a credit card machine directly from the Counter Sales module. Therefore eliminating external data re-entry, saving time and avoiding errors. The delivery route module will pre-print the delivery notes for a given truck and route with all the gases and products the customer regularly takes. The driver simply has to enter the quantities shipped and cylinders returned. The delivery note can be called up at the office and converted into an invoice. Delivery Notes can be scanned with the customer's signature and stored in the Gastrend software. They can then be printed, faxed, or emailed directly from the server to your customer. The product kitting system automatically adjusts component and finished goods inventory and calculates cost. It is primarily used for selling welding kits. Kitrend can be used to fill cylinders from bulk tanks to control inventory and costs. Control gases by Lot Number. The ability to find by customer, invoice number, delivery note number where a specific lot number was delivered with all the details of that lot number. All the modules in the Trendex systems can have the multi-warehousing option, which controls inventory of products by warehouse and allows requisitions to be placed between warehouses and Head Office. Protrend is designed to be used as a mailing system and/or as a follow up on prospects. The equipment rental system allows renting and tracking machinery by serial number. Routrend is an off truck invoicing system developed on an industrial handheld mini-computer capable of reading bar codes. Invoices for gases & products can be generated with unit prices, extention, hazmat and fuel surcharge calculated and printed on a 4" receipt paper directly in the truck. The computer in the truck may stay connected to the server in the office via a cellular connection or the information collected can be automatically transferred to the main system each day. Includes several reports to print a delivery route by customer & gas. The warranty control module allows the user to keep track of warranties and expiry dates of equipment. 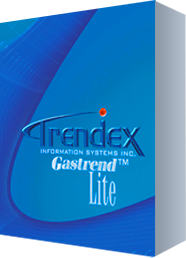 In response to the demands of the smaller welding supply and compressed gas distributors, Trendex is proud to offer Gastrend™ Lite, a complete and easy to use entry level accounting and cylinder control software package designed for one to four users. Gastrend™ Lite includes all the features required to automate your day to day business activities.